Welcome home to Hampton Hills in the great city of Tamarac. Hampton Hills is a gated community of 196 townhomes and condos recently built in 2006 and 2007 by Centex Homes. The Hampton Hills community welcomes residents of all ages and offers a nice selection of residences in 2 and 3 bedroom flooplans ranging in size from slightly over 1000 square feet to a little over 2000 square feet under air. Hampton Hills offers residents a neighborhood with an upscale feel and also offers a tranquil atmosphere and a sense of security that we all seek. As a resident here, you can enjoy the great community amenities, such as: the large and inviting community heated swimming pool overlooking a large lake, a fully equipped fitness center, a well appointed club room, children's playground and community boat ramp. The Hampton Hills neighborhood is centrally located, providing residents with easy access to The Sawgrass Expressway, The Florida Turnpike and I-595. Commuting to work is a breeze, and you can easliy zip around town with ease, because of the easy access to these major roadways. Hampton Hills is conveniently located on the North Side of Commercial Boulevard and NW 91 Avenue, West of Pine Island Road. Call us today to schedule an appointment to view the lovely residences here at Hampton Hills. You will wonder why you didn't call us sooner! Directions: Florida Turnpike to Sawgrass Expressway exit (896 South). From Sawgrass go East on Commercial Boulevard. Make Left onto Pine Island Road. 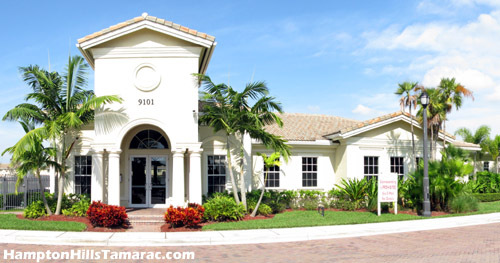 HamptonHillsTamarac.com and One Step Ahead Realty are not affiliated with the community Hampton Hills located in Tamarac, Florida.